The latest fruits of our labor of love in the Dantano community in the Asunafo South District of Brong-Ahafo Region. Catholic diocese of Goaso, Ghana. (March 27, 2014). The Team identified Dantano as a community where the new borehole would be drilled. The reason behind the choice of Dantano as the beneficiary community for the borehole is to enable the clinic to become functional through the provision of potable water and the personnel to work in the clinic. 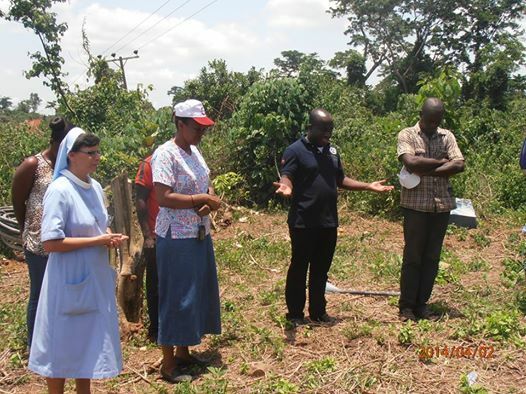 The Sisters Servants of the Holy Spirit (a religious congregation) arrived in the diocese to do pastoral work at the invitation of the bishop. One of them is a professional nurse. The nurse will constitute a team to run the clinic and take care of the health needs of the people as soon the pump is functional and the center is furnished. The health post is a one-block building but with designated rooms for the effective running of the facility. 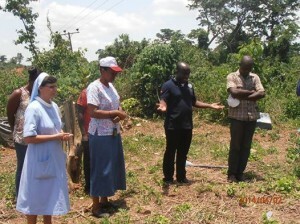 Many more of the community members will benefit from the water pump. This will drastically cut down the time they spend on fetching water and also save them more time for other useful activities. Thank you to the St. Hugh community and to Grove for Ghana!! !